Whether you are buying or selling, it's good to know the Absorption Rate. This is our month's supply of homes for sale. 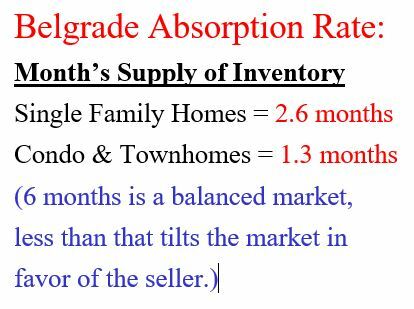 A balanced market is a 6 month supply of homes. Enough for buyers to find what they are looking for yet sellers can still get a fair price for their home. We have had a shortage of inventory for the last 3 years. The Absorption Rate for Belgrade single family homes is 2.6 months and condo & townhomes is 1.3 months. This tilts the market in favor of the seller with less than a 6 month supply.